It’s that time of year when many people make resolutions and set goals they want to accomplish in the coming year. For some, that includes writing and publishing a book, but they are not sure where to begin or how to realize their dream. Simply put, many people don’t have an idea or plan on how to get from idea to manuscript to holding a copy of their book. From my own experience and from the thousands of conversations I have had with authors at book fairs, trade shows, and writer’s conferences, I’ve found that there are six things that successful authors do to get published. So if publishing a book is on your resolution list, here are six tips to help you get that manuscript off your computer and into the hands of readers. Set a date when you want to hold the first copy of your book. The first and most important thing you need to do is set a date when you want to hold a copy of your book. That’s because research shows that people who write down their goals are 42% more likely to achieve them. Your date can be just a point in the future you choose, but it may also be an important event, such as a speaking engagement, holiday, or even birthday party. In fact, one author I worked with had the goal of getting his book done by his 50th birthday so he could give a copy to everyone who attended the party. That date became one of the key motivations for him to finish his book. Create a timeline with the milestones you need to pass to reach your publishing goal. The second thing you need to do is create a schedule with the tasks that must be completed to meet your deadline. In other words, you need to understand what is needed to get from where you are to where you want to be and set appropriate milestones along the way. If you already understand how to get a book published, you may be able to do this on your own, but most authors need to work with someone who knows the publishing process to make this happen. Your timeline should include important steps like completing your manuscript, editing your manuscript, submitting your manuscript, and allowing time for both the cover and interior design. Of course, the timeline for the book will depend on the type of book you are writing. For example, a children’s book will take less time to edit than a lengthy historical fiction novel, but you would need to make sure you allocate the appropriate time for illustrations. Determine the best time for you to write and make an appointment on your calendar for that time. My third tip is to determine the best time for you to write and block out that time on your calendar. What I’ve learned from my own experience and conversations with multiple authors is that most of us can write more in one good hour than in three hours when we are not ready to write. I recall one conversation with an author who has published more than twenty books, some traditionally and some self-published. I was having lunch with she and her husband and I asked her if there was a time that was better than others for her to write. Before I could finish the sentence, her husband blurted out, “five thirty in the morning.” By his own observation he had noticed that was the most productive time for his wife to write. If you want to get work done, it’s very important to know what time of the day you write most productively and make sure that time stays available for you to work on your manuscript. Make yourself accountable to someone. The fourth recommendation I have is to be accountable to someone. Share your goal and milestones with someone who will encourage you and help you stay on task. It could be a friend, a spouse, an editor, an agent, or a publishing consultant. Fact is, most of us work better when we have someone checking in and reminding us of our deadlines and research proves that out. In the same study I cited earlier, the researchers also concluded if you share your goals with another you increase your odds of reaching them. They call it having a “partner in believing”. Setting a date when you want to hold a copy of your book is a key to getting to your goal. Start planning your promotion before you finish your manuscript. Now, this may seem like putting the cart before the horse, but with the advent of social media and the other opportunities we have to communicate, you can have people anticipating the launch of your book long before you finish your manuscript. One of the key things you must do to promote your book successfully is identify your audience. For whom is your book intended, and who might actually enjoy reading it? This is a seemingly small thing, but it’s very important, because it lays the foundation for promoting your book. I asked an author one time who the audience was for his book, and he very seriously looked at me and said, “Every man, woman, and child living on this planet.” While his ambition is admirable, he is setting a completely unrealistic goal. Defining your audience is the foundation to a good promotional plan. Plan an event to celebrate the publication of your book. Many people start writing a book, but far fewer get to the goal of publishing, so when you do, it is time to celebrate. It’s actually quite fun to think about it when you’re doing the hard work of editing and revisions and proofreading. You might want to mark the occasion by holding a book signing at a bookstore, but you can also be creative. Depending on your book, you may want to host it at a kitchen store if you have a cookbook, or a church if you have a spiritual book, or a school if you have a children’s book. Just be sure you take time to celebrate your accomplishment no matter the venue. If you found this information helpful, I would suggest you also look at The Author Learning Center to help you on your journey. There are tools and expert advice at your fingertips to help make 2018 the year you become a published author. What is the most important thing for non-fiction authors: Write with clarity. I think it is a daunting task to write a book on how to write well, yet there are volumes of such books published each year. Few become classics, like The Elements of Style, but there is a new book published today that I think is worth noting. The title is Good Prose: The Art of Nonfiction. 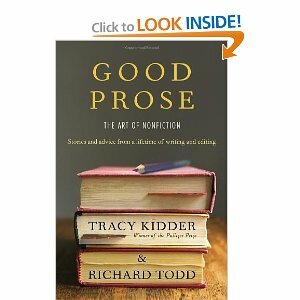 It is written by Tracy Kidder and Richard Todd and in the description of the book, the publisher makes this claim, …Good Prose—like Strunk and White’s The Elements of Style—is a succinct, authoritative, and entertaining arbiter of standards in contemporary writing, offering guidance for the professional writer and the beginner alike. This wise and useful book is the perfect companion for anyone who loves to read good books and longs to write one. Time will tell if this volume holds up to that claim, but the sections I have read are quite good. Here are some of the statements I found particularly insightful. Some of these excerpts will also featured in an article in the Wall Street Journal’s weekend edition. To write is to talk to strangers. You want them to trust you. You might well begin by trusting them. No doubt you know some things that the reader does not —why else presume to write?—but it helps to grant that the reader has knowledge unavailable to you. This isn’t generosity; it is realism. Good writing creates a dialogue between writer and reader, with the imagined reader at moments questioning, criticizing, and sometimes, you hope, assenting. What you “know” isn’t something you can pull from a shelf and deliver. What you know in prose is often what you discover in the course of writing it, as in the best of conversations with a friend—as if you and the reader do the discovering together. Beginnings are an exercise in limits. You can’t make the reader love you in the first sentence or paragraph, but you can lose the reader right away. You don’t expect the doctor to cure you at once, but the doctor can surely alienate you at once, with brusqueness or bravado or indifference or confusion. There is a lot to be said for the quiet beginning. Meek or bold, a good beginning achieves clarity. A sensible line threads through the prose; things follow one another with literal logic or with the logic of feeling. Clarity isn’t an exciting virtue, but it’s a virtue always, and especially at the beginning of a piece of prose. Some writers seem to resist clarity, even to write confusingly on purpose. Not many would admit to this. For many other writers, clarity simply falls victim to a desire to achieve other things, to dazzle with style or to bombard with information. It’s one thing for the reader to take pleasure in the writer’s achievements, another when the writer’s own pleasure is apparent. Skill, talent, inventiveness, all can become overbearing and intrusive. The image that calls attention to itself is often the image you can do without. Sometimes the writer who overloads an opening passage is simply afraid of boring the reader. A respectable anxiety, but nothing is more boring than confusion. You can’t tell it all at once. A lot of the art of beginnings is deciding what to withhold until later, or never to say at all. Take one thing at a time. Prepare your readers, tell everything they need to know in order to read on, and tell no more.